Evolution presents the variety of living things in the form of a family tree, with related species being linked by a common ancestor. But how can an impression of this huge tree be given in a single book? One way is to try to present the whole tree, at least in outline. This won't give much space for each species, and will be dominated by microscopic organisms - OK if you like that sort of thing, but many people would prefer species they can relate to. Alternatively, one could take a single species, in particular humanity, and describe how evolution progressed towards this species. This has a severe problem, in that it suggests that evolution is purposeful, something which most people in the field strenuously deny. In this book Dawkins avoids the problem by going backwards. The reader is taken on a pilgrimage back in time, being joined by other living things along the way. 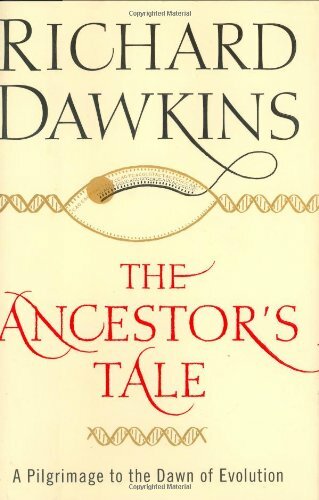 Each chapter represents what Dawkins calls a Concestor, that is the common ancestor at a joining in the evolutionary tree. Thus we go from concestor 1 to concestor 39. The idea of a pilgrimage comes from Chaucer's Canterbury Tales, and within some chapters there are 'Tales' from some of the animals which have joined. The Tales are not a description of the animal, rather each is an essay on some topic in evolution, to which the animal is relevant (to some degree). Taxonomy started by trying to divide living things into separate categories. For instance vertebrates are divided into fish, amphibians, reptiles, birds and mammals. However, recently a classification in terms of cladistics has come to the fore, that is classifying organisms in terms of clades - groupings of animals with a common ancestor. For instance fish are not a clade - if you want a clade including fish then you also get the rest of the vertebrates which are descended from fish. The structure of The Ancestors Tale naturally emphasises the cladistic point of view of taxonomy. Another major advance in taxonomy is the ability to decode the DNA of organisms on a fairly routine basis. This has sometimes lead to conflict with previous classification of organisms - in this book Dawkins makes clear that he follows the molecular evidence. Molecular genetics relies heavily on computer power, as do many areas of modern taxonomy. Many of the Tales tell of new areas of study that this has opened up. I would note here that Dawkins' research assistant Yan Wong played a major part in the production of this book, in particular in the inclusion of these computer based studies. Eventually we reach Concestor 39, the last common ancestor of all living things. However, this was not the first living thing - there is still quite a way to go back. In the penultimate chapter, Canterbury, Dawkins describes some of the speculations about the origin of life, in particular the 'RNA World' idea. The final chapter, The Host's return, speculates on how much of life would be the same if evolution were rerun. This will be of interest to those of you who have read the works of Steven J Gould, who was a leading proponent of the non-directedness of evolution. Dawkins emphasises the occurrence of convergent evolution, implying that a rerun would produce similar life. However, he also distances himself from the idea, put forward by people such as Simon Conway Morris, that a rerun would produce pretty much identical results. A common problem of collections short essays is that they become repetitive, rather than using the space to go more deeply into the subject. As the Tales were written specifically for this book, I feel that they manage to avoid this problem. The one problem some people might have with this book is deciding how to read it. At over 500 pages, many people wouldn't want to read it from beginning to end - it is the sort of book you are likely to want to read a section at a time. Unfortunately the Concestor chapters don't lend themselves well to this - some are only 2 pages in length, while the one in which we are joined by the insects is about 75 pages long. I think that some additional structure would be useful, possibly based on geological events. However, that is only a minor criticism, and overall the book works very well. This is a large format book with plenty of colour pictures and illustrations. The regularity of the structure keeps one reading, while the variety of the Tales prevents it from getting stale - and Dawkins knows how to write interesting articles. Also the structure of the book helps one to remember what has been written - an improvement over many books I've read. Dawkins deals with the subject in a non-technical way and I feel that this book would make an impressive addition to anyone's bookshelf.